Passiontree Velvet is a new café in a crowded St Ives scene. As the latest offering from the Brisbane based chain, Passiontree Velvet St Ives has added the element of breakfast/brunch to a well-established and successful formula. Passiontree Velvet started life in Queensland with outlets in Brisbane and the Gold Coast, then it made the bold move of opening a store in Macquarie Shopping Centre in 2015. Now they have muscled their way in to St Ives. Sitting in the old Max Brenner location with Pattison’s original patisserie right next door they are bringing their “edible luxury” of stellar afternoon teas, cakes and macaroons and adding breakfast and brunch to this crowded market. Taking time to understand the locals, they have elected to use Pablo and Rusty’s coffee which is an excellent choice to complement their extensive range of teas (Dorchester Breakfast, Earl Grey, Paris, Darjeeling to name a few). They also have a couple of filter coffees available including a honey-processed Elida Estate and a washed Guchiro from Kenya. Breakfast starts from 7:00am and centres on the usual suspects of eggs, avocado and salmon. 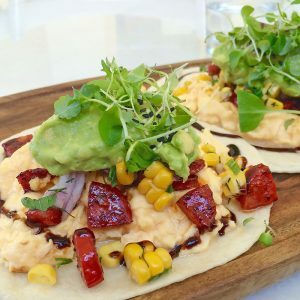 I had the Breakfast Taco which had scrambled eggs, honey-glazed chorizo, corn, avocado and a smattering of onion served on a couple of corn tortillas. When it arrived, it was beautifully presented and very tasty with the avocado stacked high on the bed of eggs and surrounded by a small drizzle of barbecue sauce. The tortillas were soft and fresh and eggs were cooked perfectly. 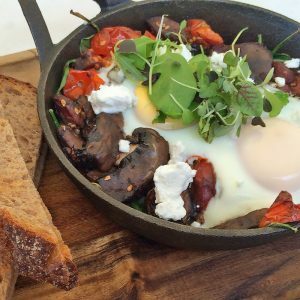 My dining partner had the simpler sounding but much more substantial “Skillet Eggs” which consisted of two baked eggs served with spinach, mushrooms, feta and herbs. Served with a couple of huge slices of rye sourdough toast it was a sight to behold and a great way to start a weekend. I was pleased to see the steady stream of locals coming in to sample the menu. Breakfast is a tough sector of the market to crack and people of St Ives can be fickle, but Passiontree Velvet seem to be carving out a slice for themselves. 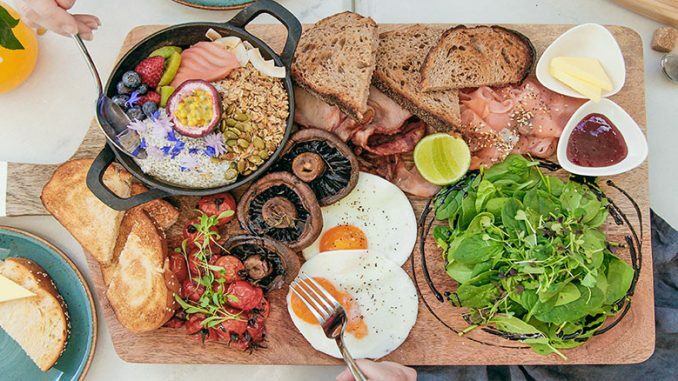 Next time I go back I’ll be heading for the Big Breakfast Platter which seems to have the entire menu delicately placed on to a large wooden board; Bacon, smoked salmon, mushrooms, eggs, yoghurt, granola, fruit and toast! That sounds like a brilliant way to start the weekend sharing some food with friends.